THEY improv provides a variety of offerings to help law firms meet the needs of their clients. This includes a variety of MCLE programs as well as skills training workshops and role-playing to help with mock trials and practice efforts. This page is a site map for the web site. Simply look below for links to each page within the site. 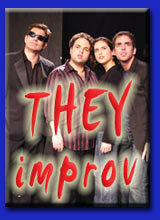 THEY improv is a leader in providing workshops for Fortune 500 and other companies. This has included working with many law firms for their team building needs. Recognizing the need to redefine training programs for attorneys, THEY improv began developing a variety of new approaches to the concept of developing the professionalism of members of the Bar. This page has been created as a site map allowing people to better access the pages of information about the different areas we serve including the skills training, role playing, entertainment and team building elements of our company.